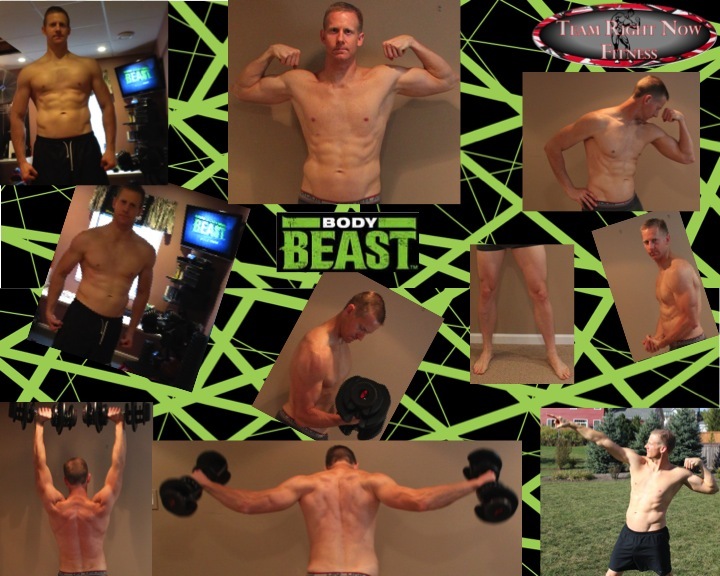 The 3rd and final Block of Body Beast is called “BEAST“. 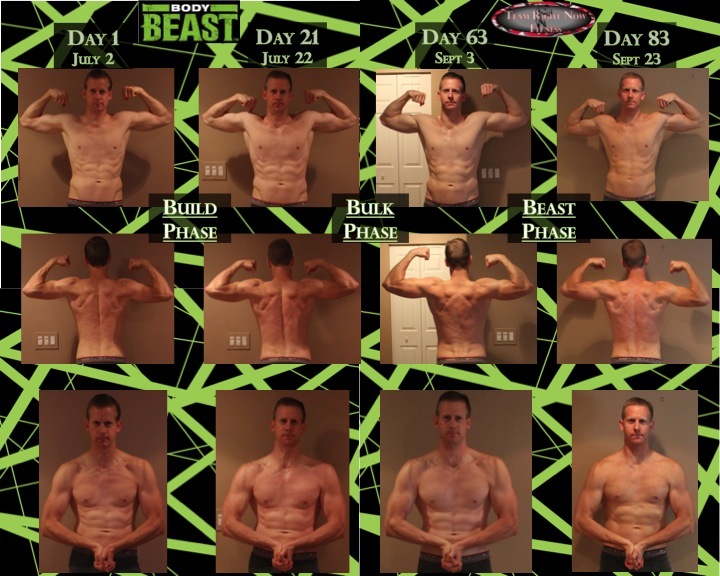 Body Beast is a bit different than say P90X where each macrocycle is around the same amount of time. As laid out in the “HUGE BEAST” schedule, it lasts 3 weeks. The 1st Block was called “BUILD” and lasted 3 weeks, the second called “BULK” lasted 6 weeks. .
– If you haven’t read my post on BUILD head over there by clicking HERE. – f you haven’t read my post on BULK head over there by clicking HERE. To see the full calendar as laid out in the program, you can head over to my ULTIMATE worksheets and download them HERE . There are no new workouts in the BEAST block. You will be mixing up the workouts you have done up to this point. So in a short 3 week time frame, there is a ton of variety! I actually followed the schedule pretty darn close for this block. However, there are some additional workouts I threw in there. Like any 90 day program I have done, by the end you are ready to switch it up again. I was getting tired of the workouts by the last week. But you need to hang in there and keep pushing! 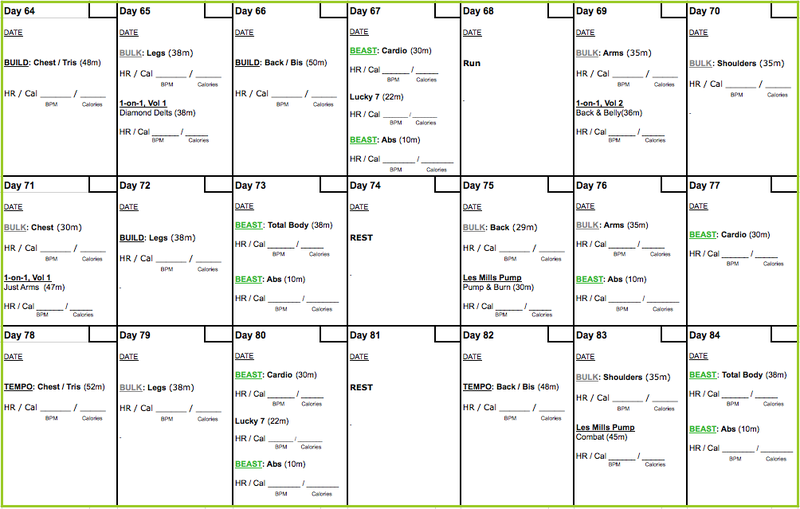 So here is the calendar I created for the 21 days of BEAST Block. 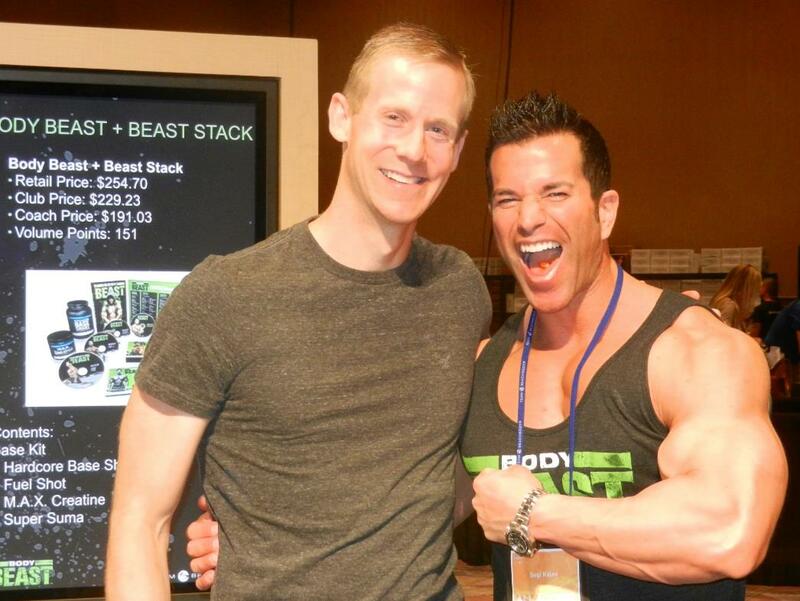 Beast Supplements and Beast Nutrition go hand in hand, especially in a muscle mass programs. I detailed out my entire plan in my BUILD Phase Post. Although the “Book of the Beast” calls for a calorie reduction and am increase in protein to 50% in the Beast Block, I modified a bit. So here are My Fitness Pal results for the last 3 weeks. Although my goal was set at 4,000 calories for the first two blocks, I wanted to slowly decrease my calories this block. So you can see from the graphs that I was slightly below 4,000 for the first couple of weeks, but went below 3,500 the last week. Another thing was that I didnt want to radically change was my macronutrient ratio as I was nervous I would start losing weight. You can see in the last week, although I decreased my calories, I increased my Carbs to try and hold my weight firm as I started to lose. As you will see in my results, I actually lost a pound during this phase, which is admittedly a negligible number. As an Ectomorph, it is really tough for me to gain weight and put on muscle. 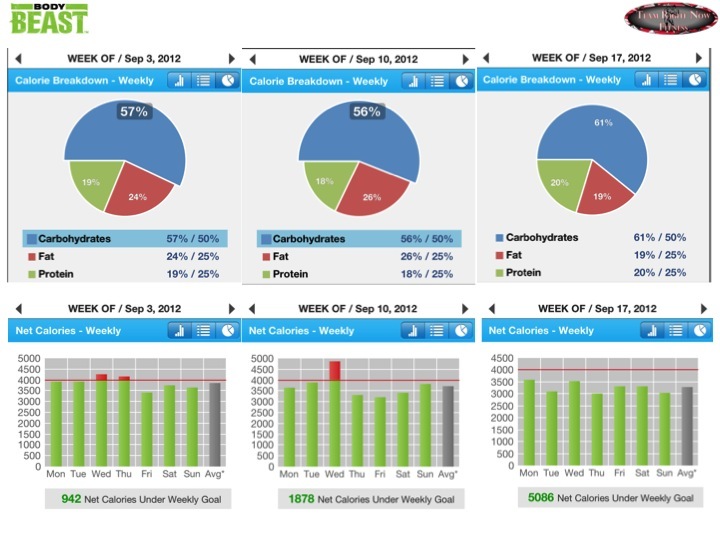 After gaining 8 lbs the first 3 weeks during BUILD, and 2 lbs the middle 6 weeks during BULK, I knew that I was not going to put on much more weight given the calorie reduction. So losing a small amount of weight (a pound) was somewhat expected. Over the entire 84 days, I was excited that I gained 1.5″ in my chest, over an inch in my thighs, and an inch in my arms! Outside of measurements and pictures, I feel awesome. It is different than after finishing something like P90X2 where I felt lean and ready to take on the world. (My picture in the top sidebar is after X2. )This was more of a feeling of raw strength. My leg definition is the best it has ever been and my upper torso really feels stronger. My upper chest has never been this strong (thank you incline press / fly)! What I think suffered in this program was my core. There is not alot synergistic exercise in this program. Nor is there supposed to be. 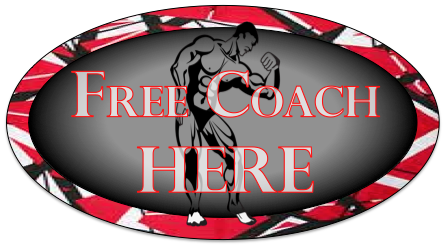 This is about muscle isolation with the goal of hypertrophy. Outside of a couple of ab exercises each workout and “Beast Abs”, there is not alot of focus on the front / side of your body from your chest to your quads. I have been wanting Beachbody to do a mass building program for years. And does this program deliver? YES! Was I expecting to look like Arnold after the program? No! But I did want to gain muscle mass, which is really challenging for me. So gaining 9 lbs of lean muscle is pretty awesome in 84 days. Especially for an ectomorph! One of the most confusing parts of mass building is supplementation, which is a requirement for someone like me. It’s confusing because there are SO many products out there! Beast takes all the guessing out of the equation. I see so many people using other products, which is fine. But what I will say is that the Beast supplements are very good. You can look at all my supplement posts to know I have tried alot of different products. My recommendation is try the Beast supplements. Follow the plan as laid out. Follow the program that spent 2 years in development! Next week, I will be writing about my experience over the past year being Vegan (with the exception of Whey Protein). As I wrote in my BUILD post, I was a bit uncertain how being plant-based would work out for me. There are plenty of sites out there, like VeganBodyBuilding.com, that show countless people absolutely ripped without eating meat or diary. But how would it work for my body type? Or maybe the question is whether I think my results would have been much different if I was not vegan. Last summer, I was eating meat (not diary) and worked to build muscle mass. I used mass gainers, protein supplements etc. However, I had another goal as well. Train for an Olympic Triathlon! LOL! (See my training and nutrition plan HERE.) What I learned from that is you can’t have 2 competing goals. You cannot expect to gain weight when you are buring over 1,000 calories a day. So I knew I had to follow Body Beast and really limit cardio. And in doing that I have accomplished my goal! As you know, Body Beast’s tagline is “Whatever It Takes”. And that applies to your workouts, nutrition, and supplementation. You must be ALL IN! It is one big equation. I am excited to have others try this program and will absolutely be using these workouts in future hybrids. I had a little bit of fun taking some shots throughout the program. I am a skinny white dude so with all my pics, the glare can burn a hole in your retinas, especially outside. LOL! But remember, this is about being the best YOU and having FUN! Kim, Yeah, in workouts like X2 where you have balance movements, you work your core free of charge. However, in Beast unless you are on the stability ball (which I wasnt because i used my bench), you are woking on isolating your muscle groups as much as possible. Which is great for those muscle groups. However, I feel the way the program structured your core takes a bit of a back seat. So just supplement like you are. And maybe you want to do some of the moves on a stability ball. You will lose less weight, but the move becomes synergistic in nature.